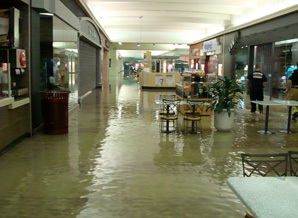 Our large loss commercial restoration services are available to business owners throughout Northern Illinois. Our business catastrophe recovery specialists are extremely well trained and equipped with the best and most effective property restoration equipment. No matter how catastrophic the damage, our team will be able to clean and restore your property to its pre-disaster condition. Skyline DKI’s large loss emergency response services are available 24 hours a day, 7 days a week, and 365 days a year. In every situation, we will work quickly and efficiently to stop the spread of damage and to repair the damage that has already occurred. We can restore any kind of property, from large office complexes to hospitals to schools. We’ll take care of water damage, fire damage, mold growth, property reconstruction, and any other problems you might have. When your business is damaged, you need the fastest recovery possible. Our team will often be able to arrive on site within minutes of your call and they’ll work tirelessly day and night to ensure that everything is fully operational again as quickly as possible. We want to make the process as easy and stress-free as possible, and we’ll even work with your insurance provider to make sure all claims are filed correctly and quickly. Skyline DKI is here for your business. If you’ve experienced a large loss, give us a call for the high quality services you need!